For your safety and the safety of the cat, make sure that you have prepared for the tiger's arrival ahead of time. You must seek professional training to learn how to properly handle a tiger. Even cats that appear generally tame can become dangerous if handled incorrectly. Do not feed your tiger beef because it can act as a laxative. Taking care of a tiger is a huge responsibility, demanding considerable resources and commitment. Unlike house cats, which have been domesticated over thousands of years, tigers are wild cats and can be unpredictable and potentially dangerous. Tigers also have dietary requirements unlike that of the regular house cat; tigers require fresh meat to survive. You must also be trained in handling your tiger, since improper handling can cause your tiger to turn on you. 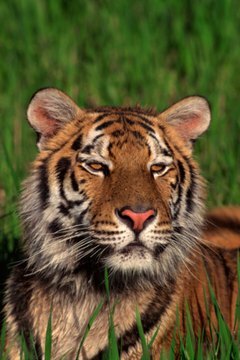 Contact a veterinarian specializing in tigers and make arrangements for regular care. Tigers require specialized care and must be treated by veterinarians who are experienced with wild cats. The U.S. Dept of Agriculture, that oversees licensing, will not issue you a license to have a tiger unless you have made arrangements with a qualified veterinarian. Contact your state’s wildlife agency to learn the state requirements for tiger ownership, then contact your local government concerning licensing requirements and zoning laws. Owning a tiger also requires you to have a U.S.D.A. license from the federal government, issued by the Animal and Plant Heath Inspection Service. Build an enclosure for your tiger that is a least 500 to 1,000 square feet. The enclosure should also have a shelter and proper drainage. Build an outer fence around it as a buffer zone to prevent anyone from approaching the inner fence. Arrange for the feeding of your tiger. Commercially produced tiger food is available directly from the manufacturers and is recommended, particularly since improperly prepared food can make your tiger sick. Commercial tiger food is primarily horse meat because it is lean and closely resembles a wild tiger’s natural prey. Ask your veterinarian to recommend a particular brand of tiger food and for a recommended feeding program.